Four turnovers derailed Central Connecticut’s hopes for a triumphant FCS Playoffs debut at New Hampshire. Despite missing its starting quarterback, and eventually losing its backup to injury during the game, CCSU hung tough against the perennial playoff participant. The Blue Devils’ defense limited the Wildcats to only 1.6 yards per rush over 37 attempts. I love you @CCSUfootball, that was the best season you could’ve ever asked for. We made history!!! 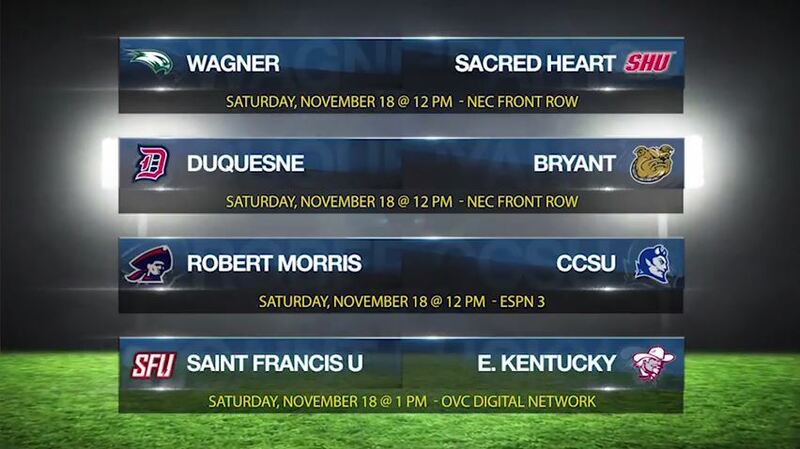 The Northeast Conference gave football fans something other than turkey to dissect at the Thanksgiving dinner table. The league unveiled its two All-NEC Teams and anointed five major individual award winners via Twitter on Wednesday afternoon. Duquesne saw one of its one etch his name onto the NEC Offensive Player of the Year award for the first time ever. NEC champion Central Connecticut produced the first non-skill position winner of the NEC Offensive Rookie of the Year award while Pete Rossomando became the Blue Devils’ third recipient of the Coach of the Year honor. Duquesne (12) and Central Connecticut (11) produced the highest number of all-NEC honorees. The former placed a league-high eight on the First Team. All seven NEC teams earned multiple all-conference selections. The end of the regular season signals the start of an avalanche of postseason honors. STATS Inc, a renowned leader in Football Championship Subdivision coverage, will again administer its Legacy Awards program and the Northeast Conference have a trio of finalists in the running for major accolades. 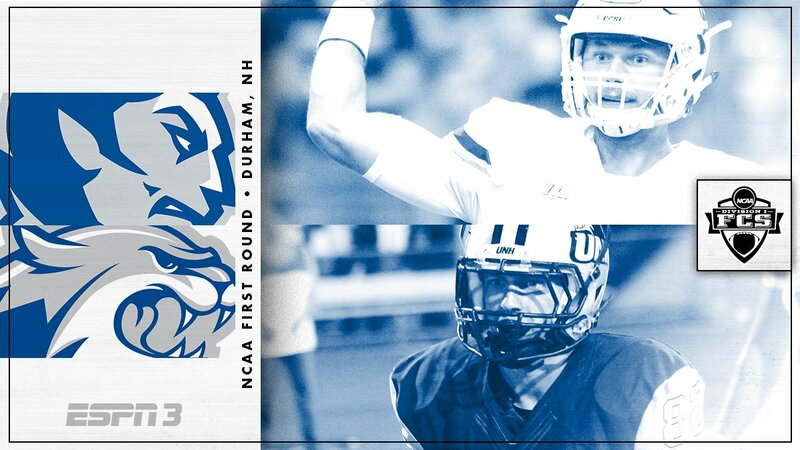 One day after clinching the first perfect NEC season since 2008, Central Connecticut learned the name of its first round opponent for its first-ever NCAA Division I FCS Playoffs appearance. The Blue Devils will head north to New Hampshire, marking the third year in a row that the NEC champion will face an at-large selection from the CAA. Saint Francis dropped a 31-21 decision at Villanova in 2016. One year earlier, Duquesne jumped out to a 14-0 lead at William & Mary before falling, 52-49. CCSU has yet to face a CAA team this season. Central Connecticut, which owns a seven-game win streak for the first time as a FCS program, secured at least a share of its first NEC title since 2010 by edging NEC preseason favorite Duquesne, 28-27, in a Week 11 bout at Rooney Field. The CCSU Blue Devils, which have scored at least 26 points in each of its last seven victories, will make their first-ever FCS playoffs appearance after locking up the conference’s automatic berth. Central Connecticut’s regular season finale against Robert Morris will stand as the featured #NECFB Game of the Week on ESPN3 at 12:00 pm ET on November 18. Saint Francis, which owns the second-highest pass defense efficiency rating in the FCS, visits Eastern Kentucky with a chance to record the program’s third consecutive winning season. Duquesne WR Nehari Crawford, who made at least one TD reception in each of the season’s first six games, added two scores to his league-leading touchdown total (13) during a Week 11 bout vs. CCSU. RB Ryan Fulse (1,114) became Wagner’s first 1,000-yard rusher since the 2013 season when Dominique Williams totaled 1,126 yards on the ground.